I was not sure what to expect when landing in Amman. To be honest, I was not sure if I would land in Amman. I sat at my office in the morning attempting to block out news of the Malaysian Airlines aircraft being shot down. Later, I would be attempting to reassure myself that the war that just began in the Gaza Strip was not the second warning I was getting that day to abandon my travel plans. I met my Dad at his office building to catch a lift to the airport. Upon seeing him, I swallowed hard wondering if this would be the last time I was doing so. I had to remind myself that if there was anything I have learned in the 3 decade’s worth of experiences I have collected it is that usually when you’re afraid, truly afraid, something incredible lies ahead. In 2005, I walked off the tube at Aldgate station in the London Underground en route to work mere minutes before it exploded, killing and maiming many. The two weeks that followed that day were some of the most fearful days of my life but in those two weeks I learned that the British, in their beautifully eloquent way of seeing the world, were right, it is best to keep calm & carry on. I boarded my flight and some 30 hours later I landed in Amman at 2 in the morning. Before collecting my bags I headed for the bathroom. Upon entering the bathroom I found myself sloshing through a puddle of water nearly an inch thick. Men stood in single file alongside a neat row of sinks, dousing themselves with water from the taps. It was Ramadan, and it was time for Muslims to begin cleansing themselves in anticipation of prayer. I have had the misfortune of numerous exasperating encounters with taxi drivers whilst attempting to reach my hotel from the airport upon arrival in a foreign land. Armed with the experience of past mishaps, I decided it was best to wait until sunrise before heading into the city. So I decided to loiter at the airport and, hopefully, find a hot cup of tea. I walked out of arrivals to see that globally ubiquitous mermaid logo that signals: Yes, you can find Starbucks in this part of the world too. Bemused, I ordered a tea and went to sit in the back of the most eclectic Starbucks I have ever patronised, and listened to tunes from Seattle artist Kris Orlowski against the backdrop of animated Arabic conversation streaming out of the Muslims around me who were savouring a final bite to eat before fast began. Immersed in a sleep induced trance, I heard the hauntingly beautiful echo of the call to prayer that I have not heard since leaving Agra in India and smiled inwardly. This is why I travel, I thought to myself. Soon after, everyone disappeared and Starbucks was closing. Fast had begun. Later that night I headed out for dinner in the city. I would quickly learn that breakfast, lunch and dinner for Jordanians incorporated some combination of pita, hummus, olives and a mélange of salads. Later, I would find myself drinking beer at a gay bar, in the Middle East, during Ramadan on top of a books cafe with 13 perfect strangers. The next week was a fast moving blur of biblical history, Roman ruins and increasingly breathtaking sights. I had gone to Jordan alone for two reasons: I did not know anyone as desperate as me to behold Petra with their own eyes and I thought it was time to throw myself into the deep end again to remind myself I can still swim; a lesson I keep forgetting in the rat race of Toronto. I was gifted my first glimpse of Petra at night, with a canopy of stars shining down upon me from above the towering canyon walls that ascend from the red clay sand of Petra. A battalion of candles lit up the ancient treasure from the floor below as some 300 people looked on in awe. You could hear nothing but the evening desert breeze reverberating off your clothes and the sounds of traditional Arabic instruments being played by our Bedouin hosts (a rebab and a flute). If I am ever to suffer from memory loss, I hope that this will be the last one that I cling to. 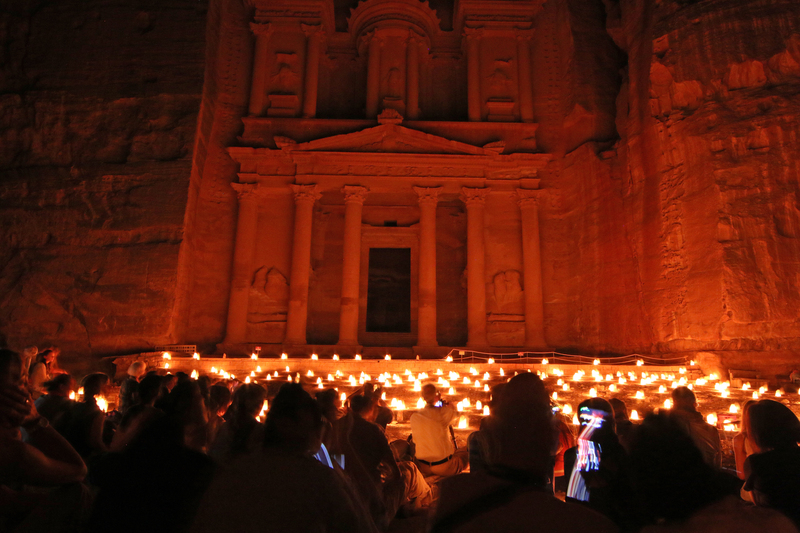 Revellers revel at Petra by Night. Two years spent living on the English side of the age-old England/Australia rivalry had taught me that Australians were people to dislike; it has taken me 8 years, several Australian friends and countless countries since to learn that nothing could be further from the truth. In the dark, en route to Petra, I had fallen quite badly. My leg was profusely bleeding and I could barely walk. My newest Australian friend cleaned and bandaged my wound as we sat in front of this epic world wonder. We would later find ourselves being forcibly removed from the site, having stayed past closing time and unable to look away. After only 2 hours sleep, I forced myself to wake up at 5 in the morning to launch into a gruelling 27km hike, limping and in agonizing pain. 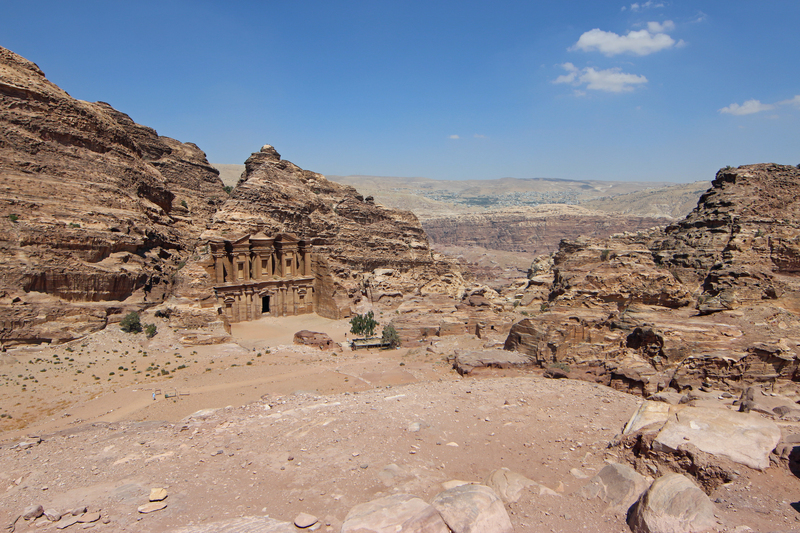 I explored each and every corner of Petra, this time by daylight. It was excruciating, especially given the unforgiving Middle Eastern sun. But some things are worth waking up at 5 in the morning for. Petra’s Treasury at 5am before the hordes of tourists descend upon the world wonder. Petra’s Monastery after climbing enough stairs to reach Heaven, the view was…well, heavenly. I floated in the Dead Sea, marvelled at ancient Roman ruins and camped in the desert with Bedouins after the most peaceful sunsets I’ve ever seen. At the end of it all, I would find myself at a barbeque on a yacht occasionally plunging into the Red Sea within spitting distance of Israel, Egypt and Saudi Arabia. Jordan shares a border with Syria to the North, Israel to the West, Saudi Arabia to the South and Iraq to the East. Still I have been more intimidated walking around the wrong neighbourhood of Toronto on a quiet summers’ night. Jordan is the eye of a hurricane. 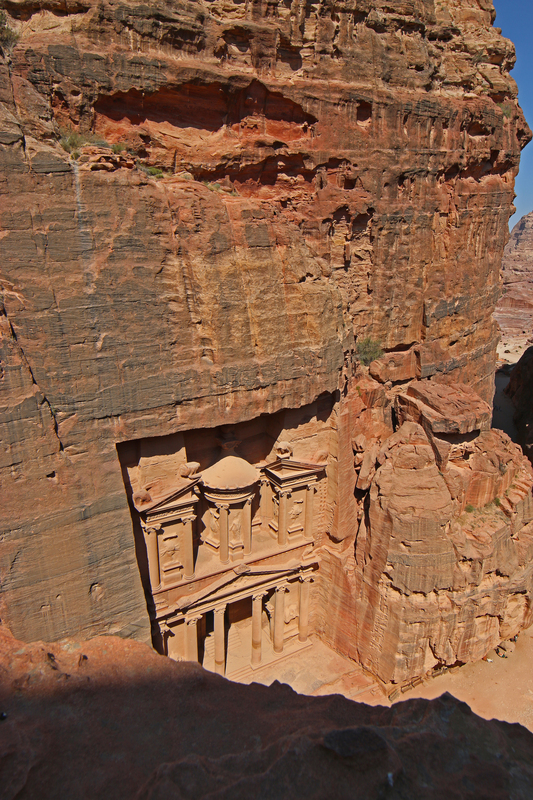 Jordan is eastern beauty fused with western tolerance. It is not uncommon to see women driving, working, smoking hookah and socialising at a gay bar, on top of a books cafe, in the Middle East, during Ramadan. The Jordan I know bears no resemblance to the Jordan I anticipated. And this, this is why I travel. Stay: Liwan Hotel in Amman (it is under renovation so be sure to ask for a newly renovated room) for its location near enough but not too near the chaos of central Amman and for its lovely windswept corridors from where you can watch the sun set over Amman. Do not leave Jordan without spending a night in a Bedouin camp at Wadi Rum. Spend a night or two in Aqaba for surreal scuba diving and refreshing snorkelling. Try: The falafel at Hashem (which counts the Jordanian Royal Family as loyal patrons) in Amman, the seafood at Floka Seafood Restaurant in Aqaba and a nightcap (or two, or three…) at Books @ Cafe on Rainbow Street in Amman for its liberal attitudes, fashionable crowds, relaxed atmosphere, magnificent view of the city and, of course, its surprisingly complete book collection downstairs. Don’t: Believe the hype. Jordan is just as safe as the next place. 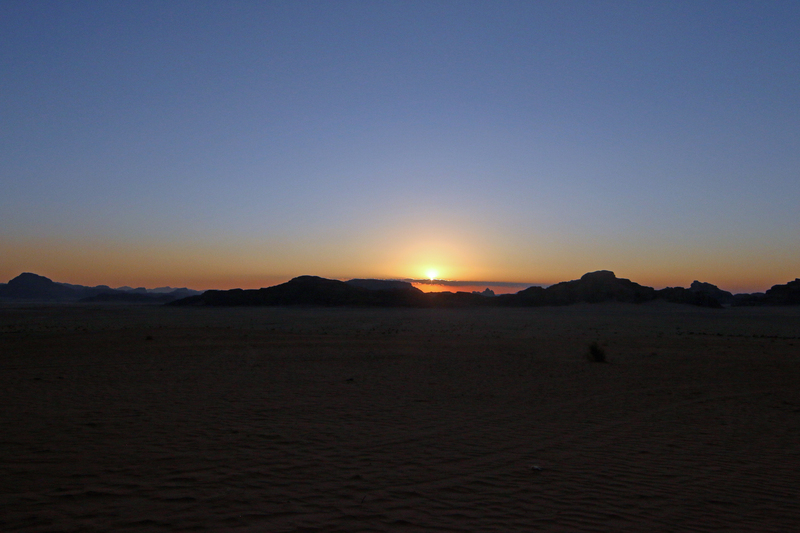 Sun descends on Wadi Rum.